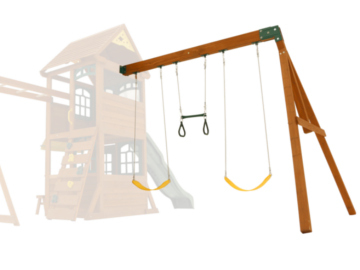 Children love having a couple of options to swing whether on supper grippy belt swings or a trapeze bar. Playing with friends or siblings. these are ideal for children's especially the grippy belt swings. 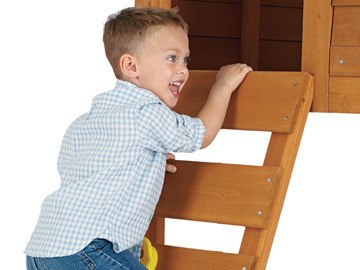 This inspires extra confidence, and provides as much safety as possible. Trapeze bars are popular with older children as they can climb, hand or swing from aerobatic handles. Buy a baby seat and swap with any swing accessory in seconds. 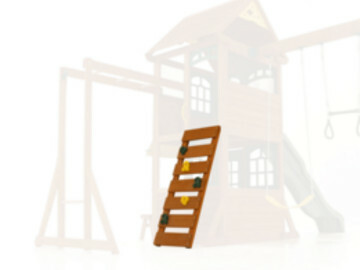 Made from the same quality cedar wood the rungs are strong, but gentle on young hands having been sanded to create an smooth easily grip-able surface for kids to hang and swing from one to the next landing up on the play deck. 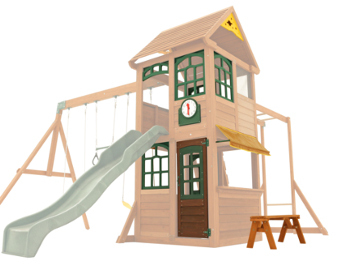 Children love role play, so let their imagination run wild in their own cubby. 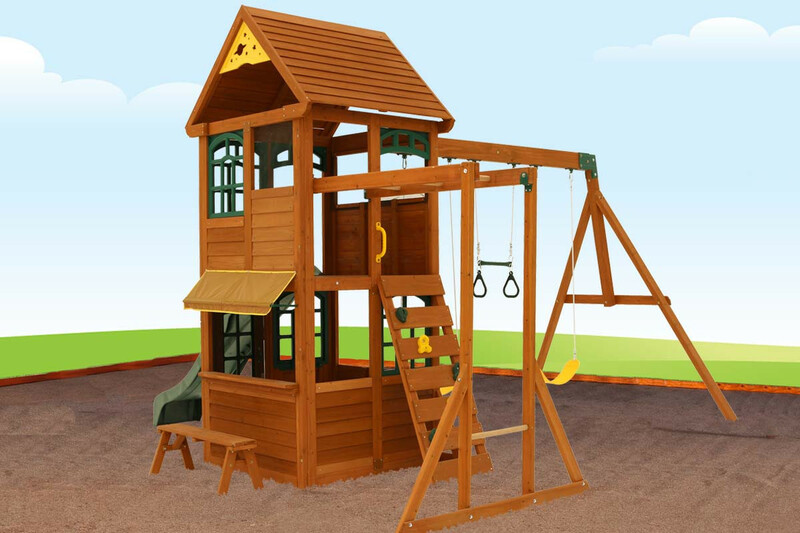 Enclosed in the lower part of the play fort, the cubby measures approximately 109cm x 109cm, so provides plenty of play space. Included is a green window frame and a serving counter. The counter is 61.4cm high, ideal for use with the free-standing bench (measuring 86cm long by 30cm wide and 31 cm high). The standing room inside the cubby is 120cm. 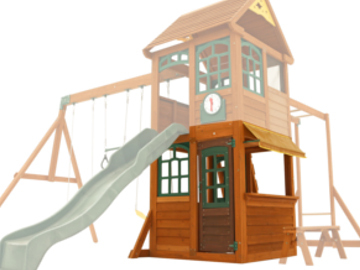 The cubby wall ensure children cannot accidentally walk into the swing area. 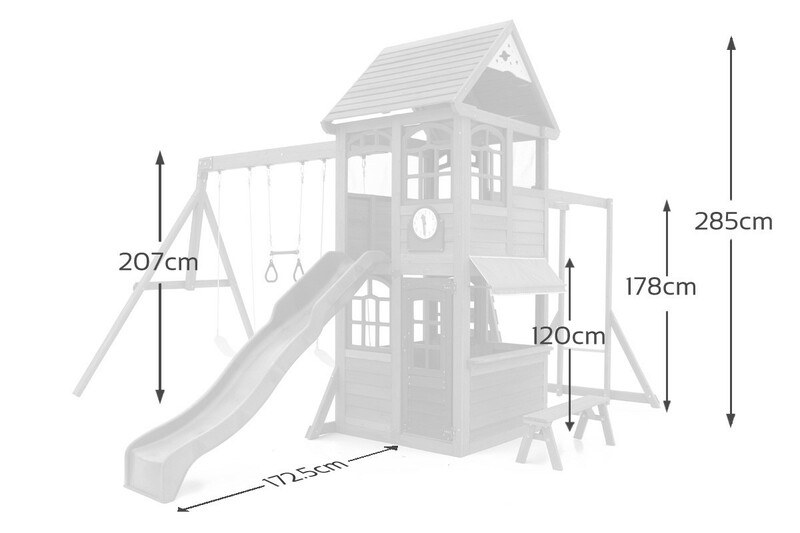 The deck is large and measures 109cm by 109cm. Maximum standing room within the cabin area is approximately 165cm. 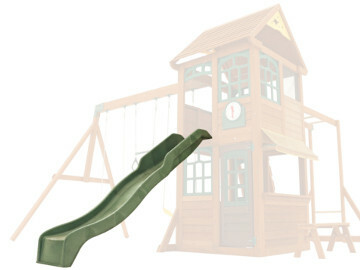 This provides a great size and shape area for children to sit with friends, or access the slide. 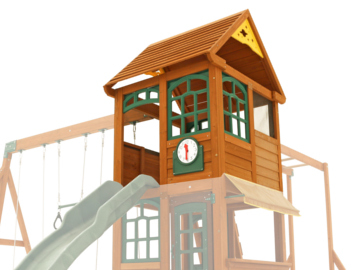 The primary purpose of a climbing frame is to provide your children with a fun, creative and social play equipment. However, having extra details to make it look beautiful is an added bonus. 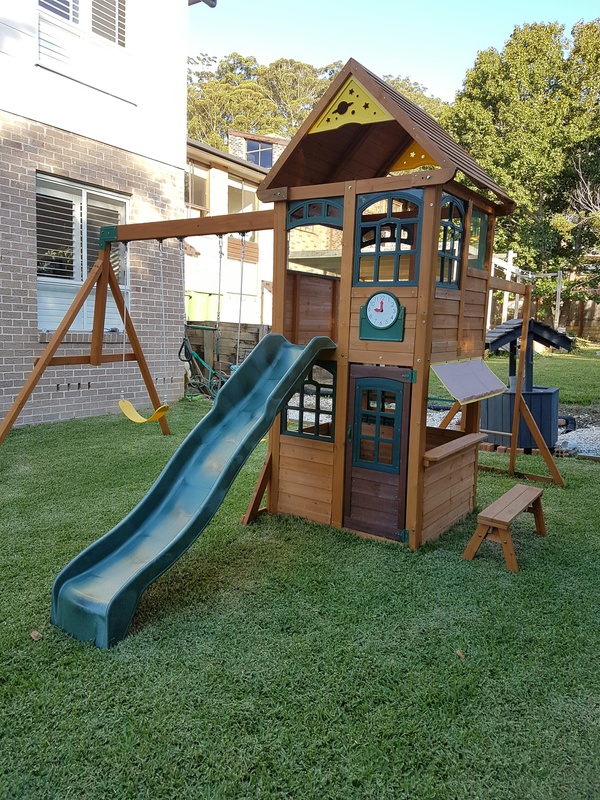 With this playset we have take time to ensure our playsets include finishing touches such as window frames, roof sunburst and a cafe counter sun shade. 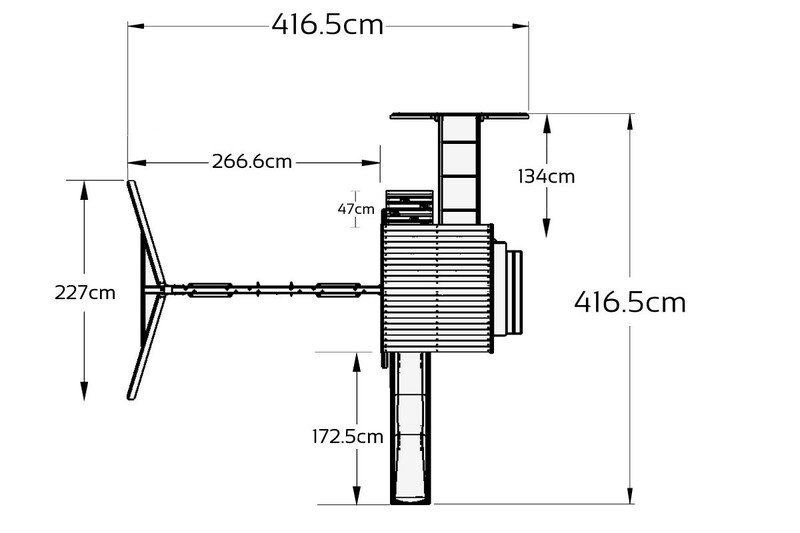 It's the little details that count, from the robertson safety screws, to 10 year wood warranty and easier home build. 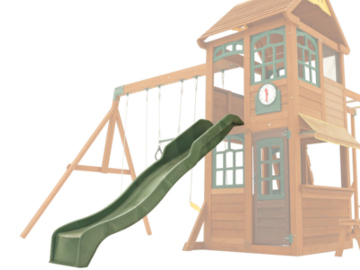 We've want to make sure you get the most complete garden play equipment possible, with as little fuss as possible. Je ne l'ai pas encore monté mais ça sera pour Noël. Le service client a été très efficace. Vous pouvez avoir quelqu'un au téléphone ou par le chat sur le site. J'ai hâte que mes enfants puissent jouer avec pendant de plusieurs années ! Penny du service client a été très gentille pour me guider dans le choix et l'achat de mon aire de jeux. Très bon service client ! Je viens d'acheter une aire de jeux pour mes petits-fils. Après avoir lu les avis et fait mes recherches sur la marque je ne pouvais pas me tromper en achetant chez Selwood. Nous avons planifié pour le recevoir à Noël pour l'offrir aux enfants. j'adore mon choix et je suis qu'ils vont aussi l'adorer pour plusieurs années ! Je posterai des photos de leurs réactions face à leur cadeau ! Awesome looking product but I don't have it yet as I have used the great layby choice. Penny has been fabulous to deal with over the phone....great customer service. Will let you know what my munchkins thinks when 'Father Christmas' delivers. Haven't set it up yet as it is for Christmas. But the customer service was amazing. You could speak to someone on the phone or through chat on the website. The option of was also great. 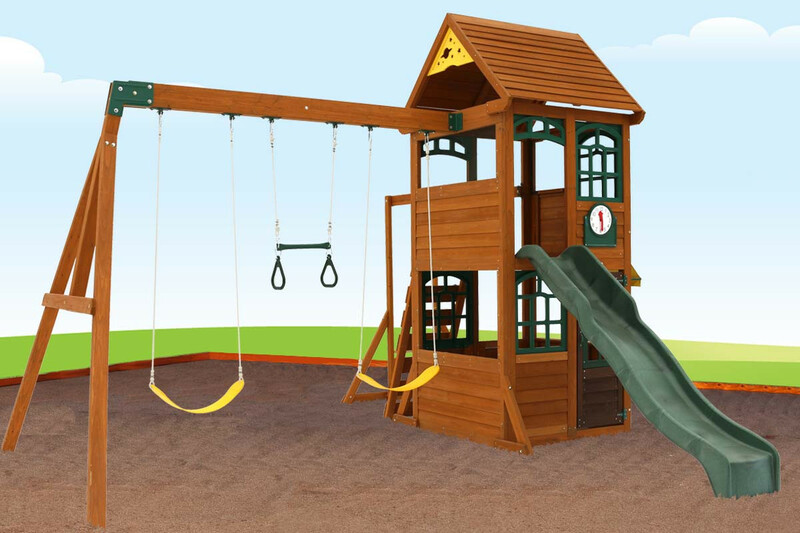 Can't wait for my children to have many years of fun on their play equipment! Zest Climbing Frame is perfect! 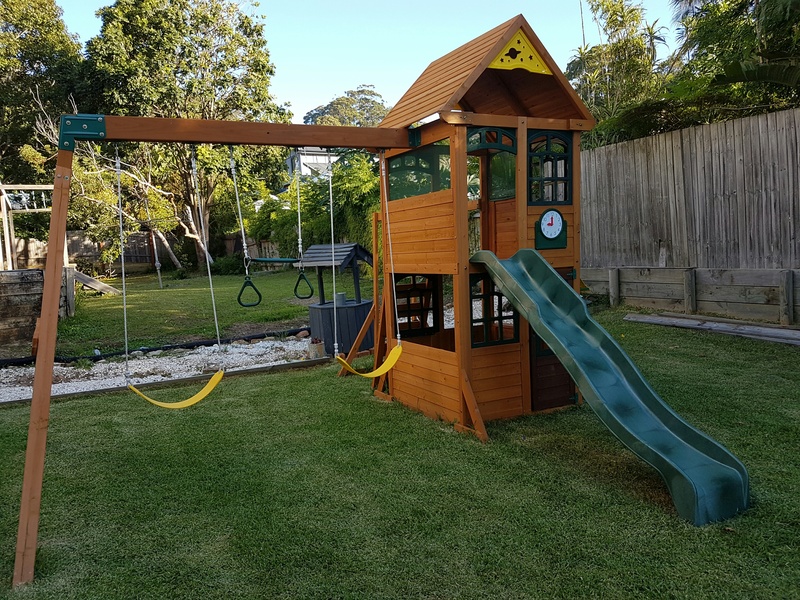 The Zest Climbing frame had everything my kids requested in a playset for the yard- a fort with slide, rock wall, swings, trapeze and Monkey bars! I built this on my own in just a couple of days with just a little help from my husband, who was so proud of me. My kids were, too, and just love playing on it! 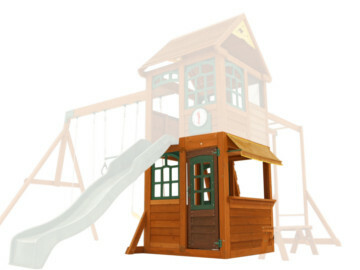 This set was easy to put together with great instructions, plenty of hardware and pre-cut, durable lumber. It's just what I wanted and reasonably priced. The free delivery was a bonus!! 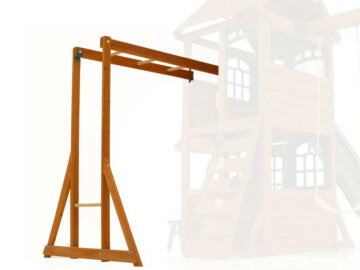 Have just purchased a climbing frame for my Grandson. 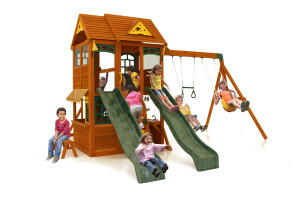 After reading the reviews and much research I decided that I can't go wrong with climbing frame Australia. We are planning on this being his Christmas Present. Love my choice as I am sure he will love it for many years to come. 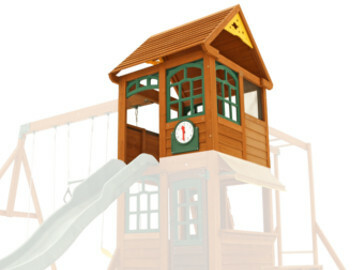 Will post pictures after Christmas of his beaming little face on his new climbing frame. 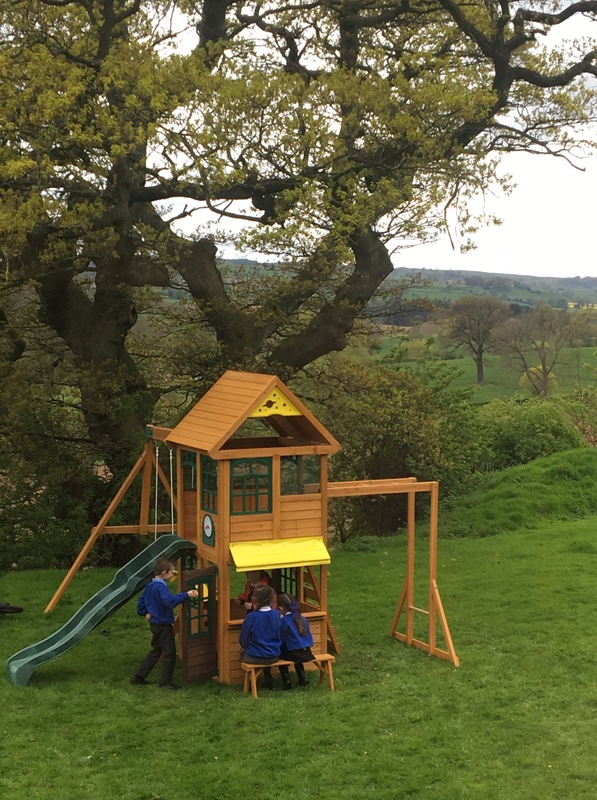 We purchased the Zest Climbing Frame for our children for Christmas and WOW do they love it! After about 16mths of ‘thinking about it’ we finally decided to make the purchase, the lay-by function was a perfect option for us. Now that we have had it for a few months, we absolutely see it as an investment. 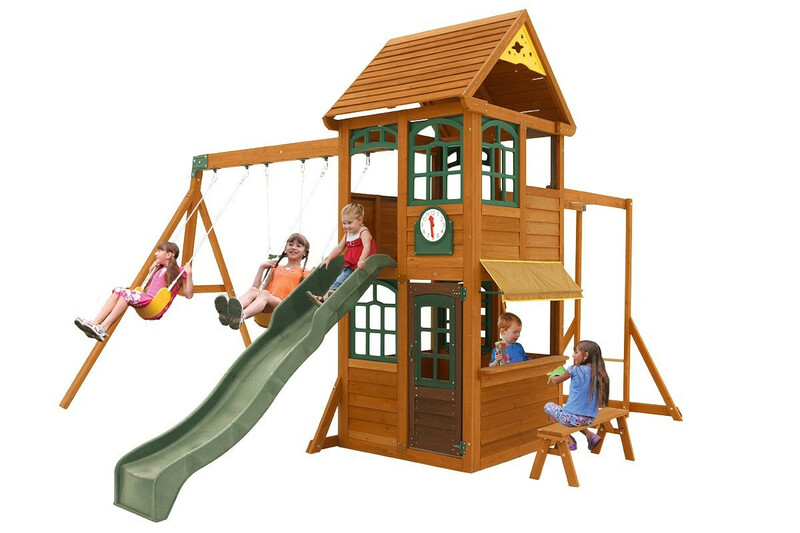 Our kids spend so much time outside playing on the swings and inventing games in the cubby and top landing, our son even wants to sleep in it. Its wonderful to see them using their imaginations. One day its a shop, the next its a dragons hiding place and sometimes a school with books and all! The product is such good quality and really study. 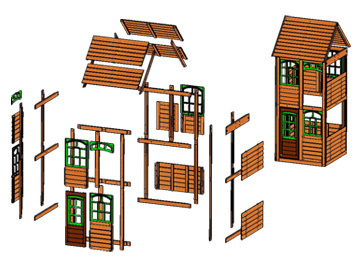 The assembly was straight forward with the step by step pictured instructions and numbered panels / items. They really have taken a lot of time to streamline the assembly process. 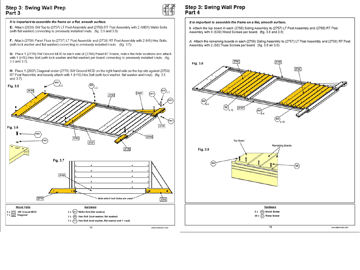 The instructions for the Zest frame says approx. 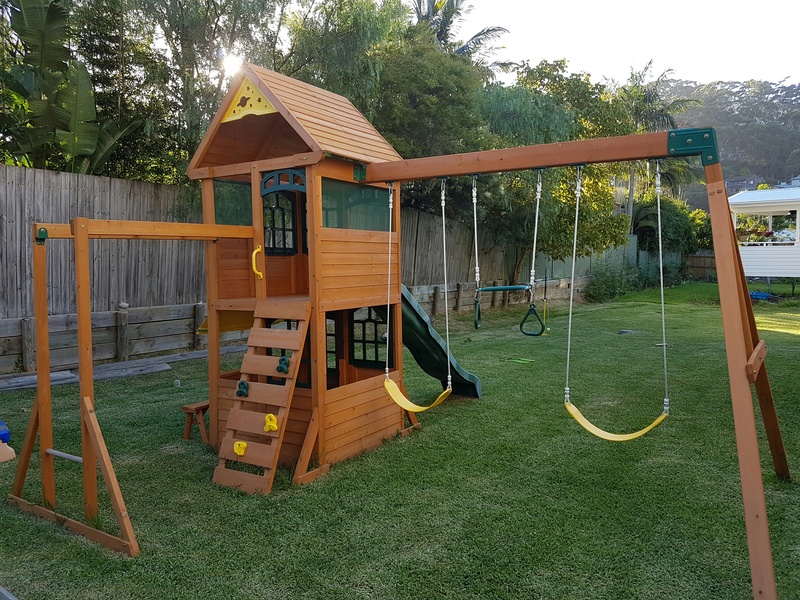 10-14 hrs for 2 people to assemble, and hubby (who is not a builder) was able to construct it with help at certain points and in about 12 hours. Setting everything out and reading the manual first was helpful. 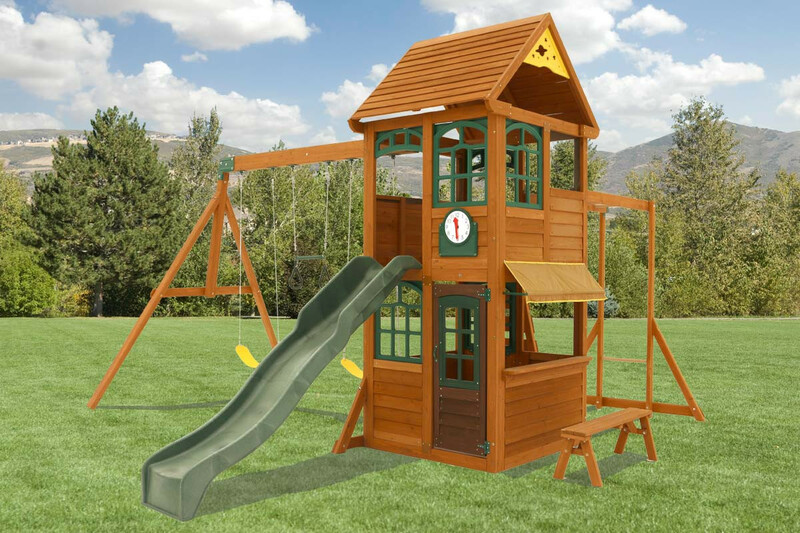 While trying to choose the right model frame for us and our yard, I contacted customer service a number of times both by phone and using the chat function. 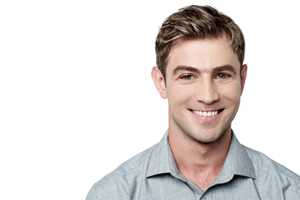 Everyone was really helpful and I found the staff over the phone really knowledgeable. This climbimg frame is awesome. 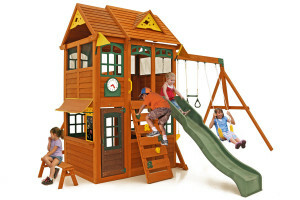 The kids absolutely love it!